The New York Red Bulls II clinched a place in the 2018 USL Cup Playoffs as they rallied from a first-half deficit to take a 3-1 victory against Penn FC at FNB Field. New York believed it had taken the lead in the 17th minute when Jared Stroud found the back of the net only for the goal to be disallowed for offside. Eight minutes later it was the hosts that struck first as Miguel Jaime slid home after a quick sequence through midfield that opened up the opportunity. 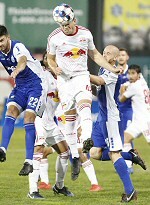 The Red Bulls II leveled through Stroud in the 32nd minute with a flicked header from Chris Lema's corner kick from the right. In the 66th minute New York took the lead when an errant punch from a free kick by Penn goalkeeper Sean Lewis fell to Briant White to put home his 10th goal of the season. New York put the game away with two minutes to go as Jose Aguinaga curled home a finish to the right corner from the left side of the penalty area to make it back-to-back road victories for the side.